A LABOUR TD has spoken of his upset after a secret recording of him saying the abortion bill would be a “starting point” for a more liberal regime in Ireland was published in a newspaper earlier this year. 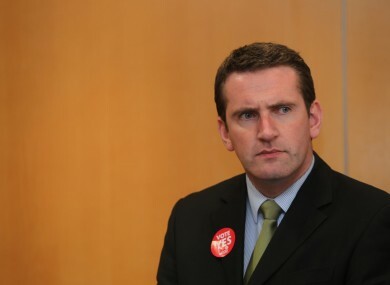 Aodhán Ó Ríordáin was one of two Labour TDs secretly recorded by a pro-life activist, purporting to be pro-choice, last year. The Dublin North Central deputy expressed the view in the recording that legislation for the X Case was a “starting point” for a more liberal abortion regime in Ireland. The recording was published in the Sunday Independent last April at the height of the abortion debate and prior to the enactment of the Protection of Life during Pregnancy Bill. “It was a very difficult time for me,” Ó Ríordáin told the The Harold newspaper, a publication put together by a team of primary school students who attend the Fighting Words Journalism summer camp. In the recordings, the Labour TD spoke about his wife being from Monaghan and how he was left “scratching my head at some of the latent homophobia” in the northern county. “I felt very sore about the whole thing. Members of my family were also upset when they read the article,” he told The Harold in an interview published last month. He said that because of the incident he was now nervous about speaking privately in his own office. In the wide-ranging interview Ó Ríordáin, a former primary school teacher, also appeared to be sceptical about replacing school books with tablet computers in Irish schools. Email “Labour TD 'felt very sore' after secret recording of his views on abortion ”. Feedback on “Labour TD 'felt very sore' after secret recording of his views on abortion ”.